The Super Grip Gloves are the best gloves for skiff sailors! They offer the best grip available without stopping you being able to run the sheets through your hands when you need to. Care needs to be taken when buying these as quality varies a lot from different suppliers. Our gloves are top quality, we buy them in bulk to pass the savings on to you. 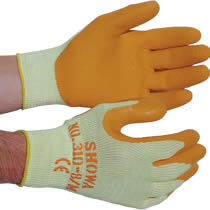 The gloves are all yellow, and available in 3 sizes, small, medium or large. Order the 10 pack to get a massive 20% discount!